The sixth edition of the Comedy Knights’ show is aptly titled Let’s Talk About Six! There is a very fine line between satire and protest. Satire is meant to protest indirectly, through ridicule, using that sharpest of tools: wit. The past year has been a particularly fraught one, politically. It all started two years ago when the Panama Papers revelations were ignored, followed by Joseph Muscat getting a landslide victory in spite of them, and the questions not answered by the Egrant report followed by the 17 Black revelations, causing nary a twitch of unease among those involved. The assassination of Daphne Caruana Galizia was followed by over a year of protests by Occupy Justice and the few hundred times the Great Siege monument was cleared. So going to Comedy Knights this year, one of the things I was wary of was whether that fine line would be crossed, whether the chance to drive a few more points through to an audience would be simply too tempting. That the topics would be tackled was a sine qua non. It was the tone that I was on the lookout for. In the programme, the intro made it clear where things were going: Maybe it’s us, but it seems like we’re a little tired of all the crap that has been happening over the last 12 months…” it says. And from the first sketch, my heart sank: Chris Dingli’s speech verged a few times into a rant, something which happened a few times through the performance. The audience on the night I was there barely chuckled at some of the heavier verbal assaults. For all I know, they may have been muttering Too damned right!” under their breath – but is that why we go to Comedy Knights? Was its agenda highjacked by that of Occupy Justice (of which actress Pia Zammit forms part)? It is such as shame that there were these few lapses, as the times that wit was used to lambast the politicians, it worked superbly, getting not only laughs but applause. 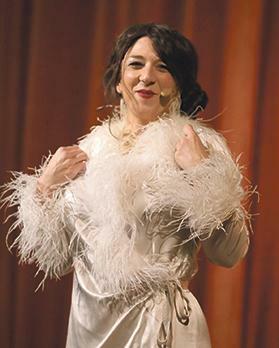 Pia Zammit stealing the show in Let’s Talk About Six! 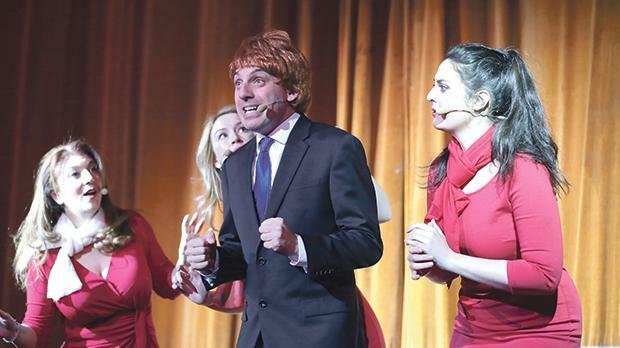 The show, as you would expect if you have been to a performance before, touched on numerous issues, from Valletta 2018, Air Malta and Melita, to the mild hypocrisy of the Maltese elite and unscrupulous landlords. Other more obscure stories were picked up from the news, including a story about an inflatable sheep (look it up on Timesofmalta.com), and young boys pushing silver Porsches. With 24 sketches, some are undoubtedly going to be better than others. Sometimes a good punchline does not sustain being spun out into a whole sketch – like the hunter robot. The show is close to two hours and 45 minutes, so it could afford to have been pruned, allowing the stronger numbers to keep the momentum going. One of the challenges of a show like this, with a set of standard characters, is how to keep the punters coming back and avoiding audience-fatigue. Moving the Bormla Babes into the Balluta Boys sketch was great fun, while Mixall is always able to raise the roof (the reference to Owen Bonnici was one example of how wit could be used to devastating effect). The show took a dig at sorting our rubbish, influencers and choosing names for a baby, to give you an idea of the range of topics. It hardly needs to be said that the performances were spot on: these are some of Malta’s most talented actors and their comic timing is second to none. That includes Steve Hili’s – which is why I am constantly baffled by the way he always portrays himself pulling faces, and turns up on stage with one ridiculous wig after another – always badly placed. He is funny enough without these cheap gags. The Sliema Babes (Jo Caruana and Pia Zammit) sketch fell a bit flat: these characters are so beloved because they are so two-dimensional and the nuances of jealousy and loneliness were lost. Mixall (Zammit) was well received by the audience, who happily chimed in to her request to get her Joseph to hear what she was saying on the phone… The Christmas cow and donkey were… well, I have no idea, what were they? And as for the stolen TV: a very clever sketch, but shouldn’t he have claimed that he was still in the house and that the TV could only be ‘stolen’ once it had been removed from the premises? Overall, a good show, but next time, more wit and satire, less mass meeting. Let’s Talk About Six! is being staged at the Salesian Theatre in Sliema tomorrow, Friday, Saturday and Sunday at 8pm.